In this episode, you'll get to hear what it's like being the owner of a large firm. Chip Munn of Signature Wealth Strategies joins us to share his journey and transition from teaching to building a fast-growing firm with multiple locations and thousands of clients. He has a lot of great insight when it comes to building a strong structure, developing a solid team, and having a powerful acquisition strategy. As a big believer in unique ability, Chip shares his passion for allowing people to fill roles they thrive in so they can contribute in a valuable way. He talks about everything from the initial structuring of the partnership base of the firm to the way they handle client relationship hand-offs from senior to junior advisors. Chip also sheds some light on how they decide on programs and technology to use, as well as other systems they put in place to smooth transitions and growth. An overview of Chip’s firm. What they specialize in and their stunning growth rate. How financing has worked for the business. Why Chip decided to make the shift from teaching to financial planning. The first stages of starting in the field and building his business. How his firm structured the partnership and delegated roles. His main role in the business. The importance of knowing your unique skills. How Chip's firm found the best fit when it came to technology and broker-dealers. Ways his business achieved rapid growth. How his firm is structured and the book that helped with this. Why he decided to use acquisitions as a way to expand to multiple offices. How the firm handles interns to make sure they deliver and receive value. Chip's strategy for handing off relationships from senior to younger advisors. How the firm aims to retain and reward talent. Their plan for growing in the future. How much money do you need to launch your own firm? That’s a question we’ve gotten at XY Planning Network hundreds—if not thousands—of times. To answer it once and for all, we developed a free budget template that accounts for the many variables of your first year in business. Along with the template, successful XYPN members opened their books for us and shared how they did it, what they spent, and what they’d do differently. 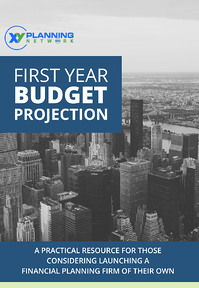 Our First Year Budget Download is an incredibly valuable resource for anyone considering launching a firm of their own. Download it for free at www.xyplanningnetwork.com/budget.